This recipe is a great way to include more fish in your diet. This southwestern seasoned fish topped with cool tasting Mango Pico makes for a mouthwatering, light meal. This recipe is from Holly Clegg’s trim&TERRIFIC® Eating Well Through Cancer. Great with fish tacos, or makes a great dip or condiment to any entrée. Preheat oven 425°F. Line baking pan with foil and coat with nonstick cooking spray. Place fish on prepared pan. In small bowl, combine oil, chili powder, cumin, oregano, paprika, and season to taste. Spread over fish. Bake 15-18 minutes or until fish flakes with fork. Spray tortillas on each side with nonstick cooking spray and warm tortillas in pan about 1 minute on each side or in microwave about 30 seconds. 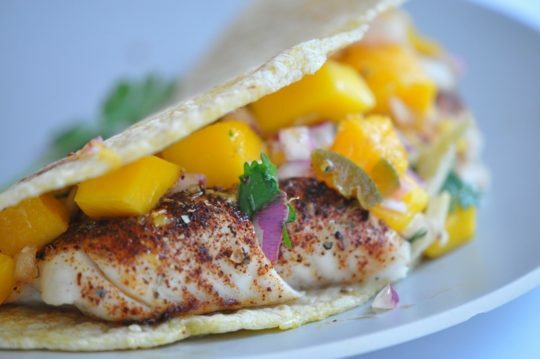 Divide fish to fill tortillas and top with Mango Pico (recipe follows). 1. In medium bowl, combine all ingredients. Terrific Tip: You can also add avocado and black beans to the Mango Pico. Don’t feel like making Mango Pico, just open a jar of salsa instead. Recipe from Holly Clegg’s trim&TERRIFIC® Eating Well Through Cancer. For more of Holly's easy healthy recipes, visit her Blog and YouTube channel.